Wang Yuan (style name Ruoshui, sobriquet Danxuan), a native of Qiantang in Zhejiang, started painting as a child and once received instruction from the master Zhao Mengfu. In bird-and-flower painting, Wang followed the tenth-century tradition of Huang Quan, and in landscapes that of Guo Xi in the eleventh century. In figure painting, he followed the Tang dynasty style, in all the above achieving marvelous results. 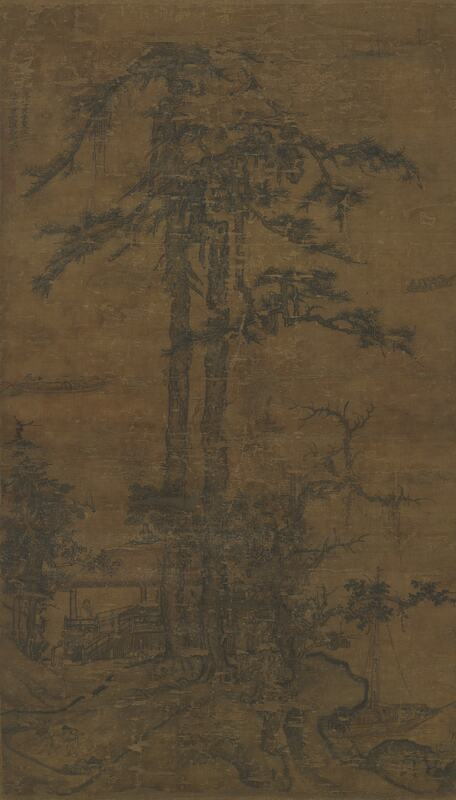 This painting features a level-distance composition with two tall pines in the middle reaching far upwards. In the foreground is a thatched pavilion by the water with two scholars inside. Behind the treetops are seen sailboats in the distance following the wind. The painting as a whole has a pure and remote tranquility, the brushwork mature and reserved but with a fitting touch of liveliness. Each stroke is solidly placed without a hint of reservation, making it equal to that of Song dynasty artists. The surviving works by Wang Yuan are mostly bird-and-flower subjects in monochrome ink, this being a rare and excellent example of his landscape painting. He completed it in the Zhizheng seventh year (1347).